Bengaluru: Lake’s on fire, but no heat on officials! The frothing and foaming Bellandur lake turned into a fiery monster last week. In 2016, the BDA decided to hand over 60 lakes to the BBMP saying it did not have the funds for their upkeep, but this does not appear to have helped matters any. The Bellandur Lake fire, which left parts of the city covered in smoke and soot, is only the latest symptom of the civic agencies’ apathy in protecting its lakes. Although five different committees have over the years made their recommendations on conserving the water bodies and the premier Indian Insitute of Science too has done extensive research and given its suggestions, successive governments have failed to act, reports Aksheev Thakur. The frothing and foaming Bellandur lake turned into a fiery monster last week , engulfing several nearby localities in smoke, much to the horror and discomfort of Bengalureans. On Monday, the Bellandur and Varthur Lake Citizens' Group and Friends of the Lake (FoL) met Bengaluru Development Minister, K J George, and key representatives of city planning authorities like the BDA, BBMP, BWSSB , KLCDA and the Karnataka State Pollution Control Board (KSPCB). At the meeting spanning over two hours, the minister said the cause of the fire was being investigated, but it was most likely caused by someone setting the dry grass around the lake on fire. While the Minister talked about setting up slew gates to control stagnation of dirty water in the lake, chairman of the BWSSB, Tushar, promised the angry people that 80 per cent of the sewage entering Bellandur lake would be treated by the end of February this year.. But Mr Sridhar Pabisetty, CEO, Namma Bengaluru Foundation laments that between the fire of February last year at the lake and the January fire, little had been done to protect the city’s water bodies. “We have filed multiple petitions but the government is in denial,” he regrets. In 2016, the BDA decided to hand over 60 lakes to the BBMP saying it did not have the funds for their upkeep, but this does not appear to have helped matters any . Ask Mayor Sampath Raj however, and he vows that the BBMP will do the job the BDA could not. “We will not shr ug off our responsibility,” he declares. The apathy of the civic bodies continues despite the National Green Tribunal’s (NGT) ordering them to remove all encroachments within 75 metres of the lakes and stop the entry of sewage into them. Going by Mr T.V. Ramachandra, lead scientist of the Indian Insitute of Science, Bellandur lake receives over 460 million litres of sewage. “When solid waste is also dumped in the water , methane is generated, which aggravated the recent fire,” he says. Also, the rampant encroachment of the Agara-Bellandur wetland has changed the topography of the region, affecting groundwater recharge and cutting the interconnectivity of the lakes. After the National Green Tribunal’s direction to the KSPCB to shut down polluting industries, over 498 industries were identified around Bellandur lake, but only 78 were shut down for their failure to install Sewage Treatment Plants (STP). IISc. lead scientist, Dr T.V. Ramachandra, says that no Storm Water Drain should be concretised as it prevents ground water recharge and can cause flooding. Sewage should also not be diverted upstream to downstream regions, he adds. Seeing the encroachment of the Agara- Bellandur wetlands, the NBF, supported by founder trustee, MP Rajeev Chandrasekhar, Forward Foundation, Bangalore Environment Trust and Praja Raag filed a writ petition against the various illegalities which ultimately led to the buffer zone around lakes being increased from 30 meters to 75 meters. The government recovered over 2 lakh hectares of the encroached land after the NBF filed the petition in the Karnataka High Court. In November 2017, the citizens’ groups supported by Mr Rajeev Chandrasekhar filed a petition with the Lokayukta which pulled up the regulatory agencies over the condition of the lakes. On Monday, Bellandur and Varthur Lake Citizens group and Friends of the Lake (FoL) met Minister for Bengaluru Development and Town Planning K J George, key representations from city planning authorities like BDA, BBMP, BWSSB , KLCDA , KSPCB. In the meeting spanning over two hours, the minister stated that the cause of fire is being investigated but likely due to miscreants setting dry grass in fire. Mr Tushar Chairman of BWSSB committed to the citizens that 80% of the sewage entering the Bellandur lake will be treated by the end of Feb 2018 and also we would have data available for the monitoring of the different STP plants. Minister also talked about setting up slew gates to control stagnation of the dirty water in the lake. Smaller STPs at Ibblur lake and Central prison were also discussed. Stopping the dumping of solid waste and construction debris on the lake bed and drains. In 1986, much before the IT boom changed the topography of the city, the government set up the Lakshman Rau committee, which for the first time highlighted the issue of encroachment of lakes. But since then successive governments have ignored suggestions of over four such committee reports to protect the water bodies. One of the major suggestions of the Expert Committee Report (2016) to desilt the Bellandur lake, which has seven million cubic metres of ammonium nitrate, has been ignored too. If anything has been done to save the city's lakes, it is thanks to people’s action. 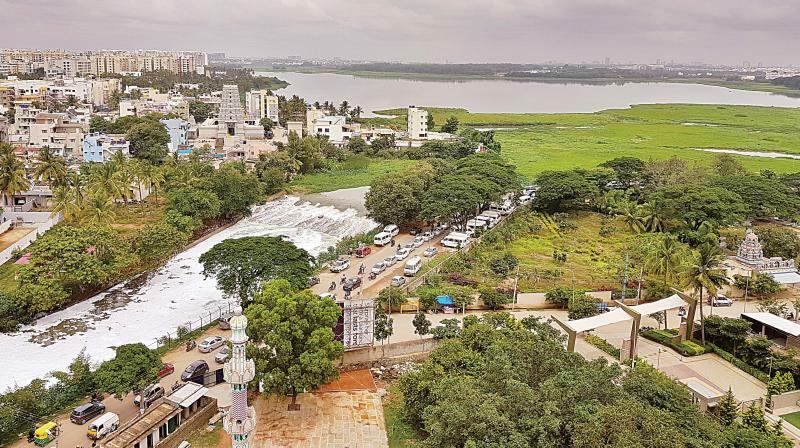 The Namma Bengaluru Foundation (NBF) filed a petition in the Karnataka High Court in the Agara-Bellandur lake encroachment case which ultimately, in May 2016, led to a historic decision by the tribunal. The buffer zone around the lakes was increased from 30 meters to 75 meters. But the order may have come a little too late as in all, 10,786 acres of lake area has been encroached upon in Bengaluru Urban and Rural. Of this, 7,531 acres has been encroached on by private agencies and 3,257 acres by government agencies. Water expert, S. Vishwanath says it is the responsibility of the revenue department to mark the buffer zones and not allow encroachments on the rajakaluves as the people themselves may not be aware that they are constructing houses on lake land. Meanwhile, the latest Koliwad committee report on lake encroachments has come in for criticism by lake activists and conservationists, who claim it is only trying to give backdoor entry to encroachers.. The proposed Revised Master Plan, 2031 has also been met with derision by the activists, who say it does not give adequate importance to conserving what is left of the city's lakes. List of encroached lakes (in acre).